Click here to leave frames. 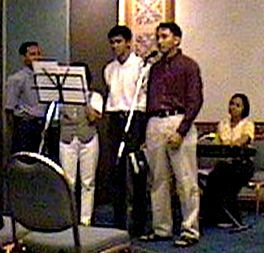 This interdenominational worship service was our English-speaking church in Yogyakarta from the beginning of our time there. Both of us preached regularly and Duane was chairman of the congregation. 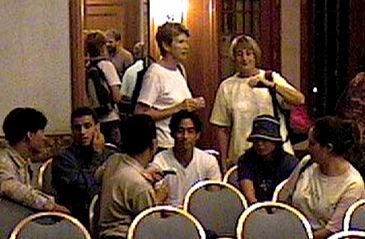 The YIC board October 29, 2001. From left: Lina, Marthen, Mary Rose, Clare Ann, Duane, Donna, Dito. 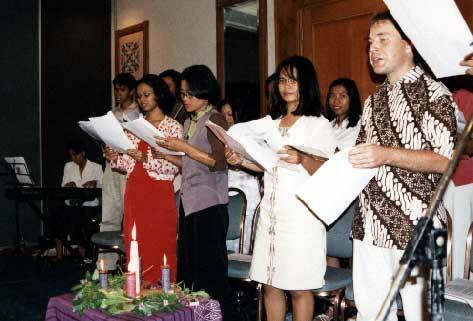 The YIC worship leaders meeting at our house March 2001. 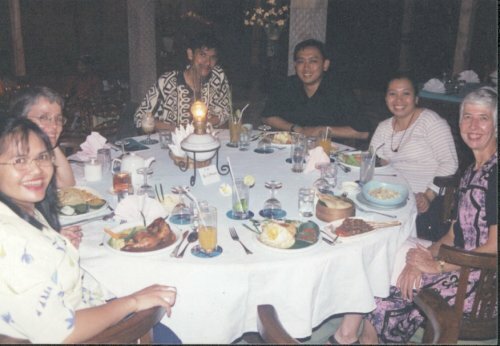 Out of the picture to the left is Siska, then pictured from left: Clare, Dito, Sisca, Marthen, Othie, Clare Ann. At this point Clare Ann and I are preaching once a month each and four others from the congregation take turns with other local preachers filling in here and there. 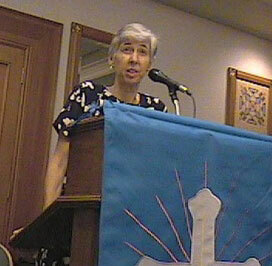 Clare Ann preaching June 18, 2000. Pdt. 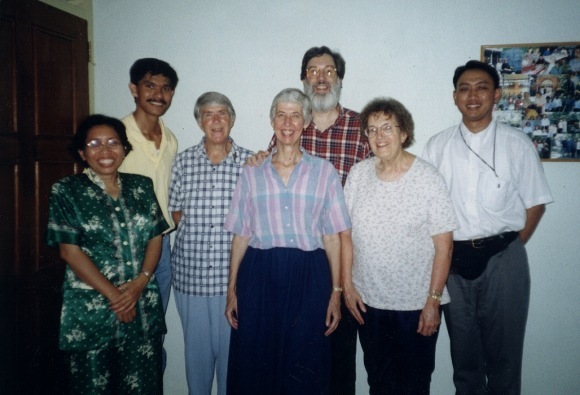 Yoshoa (left) is the official registered pastor of the church, being one of those who first encouraged it to begin and volunteering his time. 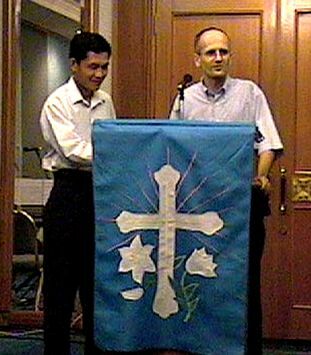 Markus Zahnd (right) is another of the founders of the congregation which began in 1995. 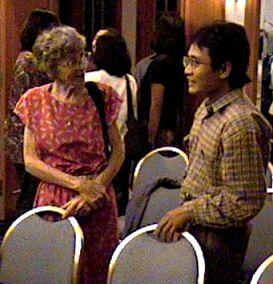 He and his wife Christine went home to Switzerland after seven years in Indonesia in July 2000. Music varies from week to week, but usually includes keyboard, sometimes guitar, and always singers. 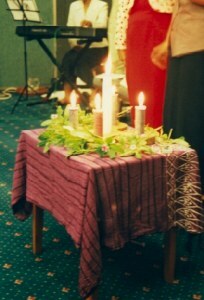 Variety is valued, since the backgrounds of the congregation are so varied. We meet at the Radisson Hotel in one of the banquet rooms every Sunday at 5:00 P.M. Usual attendance is between 70 and 100. 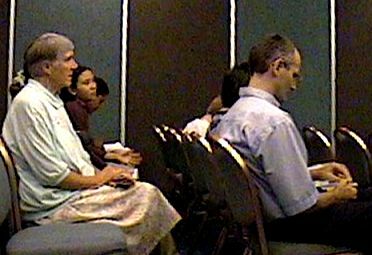 The congregation is a mix of expats from everywhere and Indonesians from all over Indonesia, most of whom are students or teachers. Here you have a photo taken by an American of people from Japan, Italy, Australia and several Indonesian islands. More pictures of YIC activities. Click a picture to see a larger view. Duta Voice, the choir of Duta Wacana Christian University, performing for us at Christmas. A congregation of mostly students and teachers sees a lot of welcomes and farewells. Here the worship leading team says selamet jalan (bon voyage) to Othie who is heading to Chicago for 18 months to get her M.A. degree. From left: Siska, Clare, Marthen, Dito, Othie, Clare Ann. 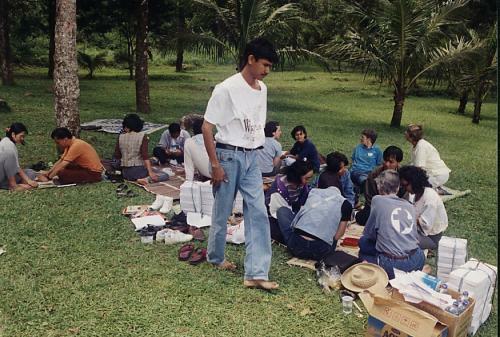 Indonesians like church picnics as much as anyone. This one was held part way up Mt. 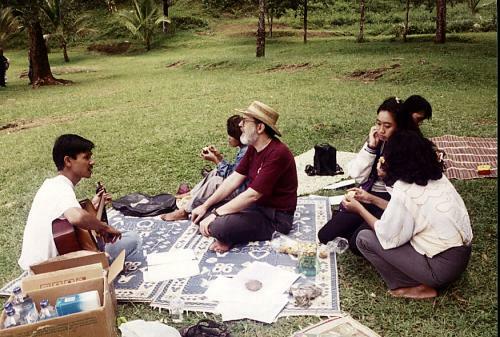 Merapi at a private picnic ground. Singing is one of the things YIC does best. We borrowed the Duta Wacana dormitory bus since the congregation has two cars among all its members. Meeting in a hotel one doesn't always get to choose the decorations. 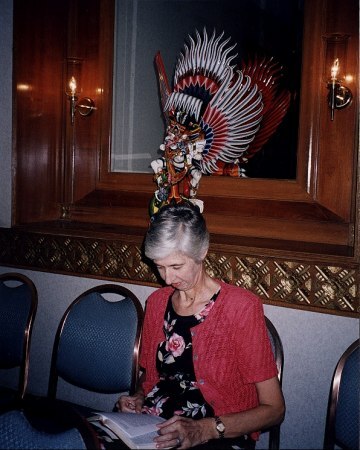 Here Clare Ann is going over her sermon under the watchful eye of Garuda, known to Hindus as the steed of Shiva. 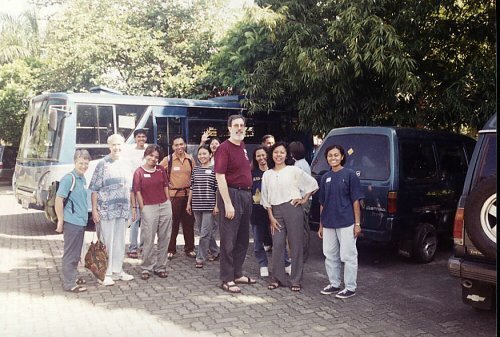 On YIC's sixth birthday, November 2001, those who had been attending from the beginning gathered for a photo. 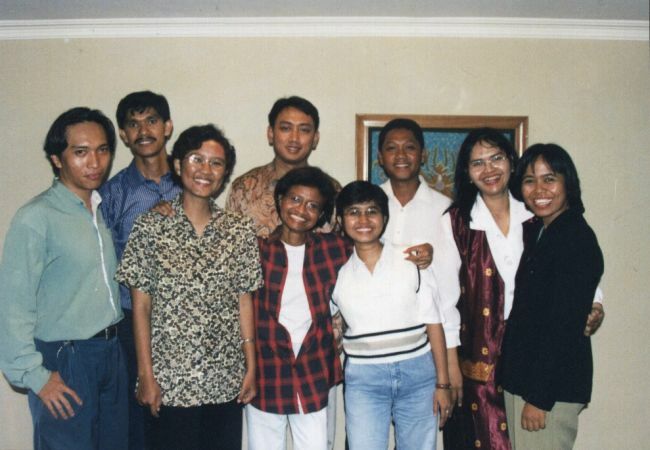 l-r: Lethus, Marthen, Priskila, Dito, Florence, Nukki, Agung, Siska, Reza. Last modified December 26, 2001. Prepared by Duane Ruth-Heffelbower. [an error occurred while processing this directive] visitors since June 6, 2000.